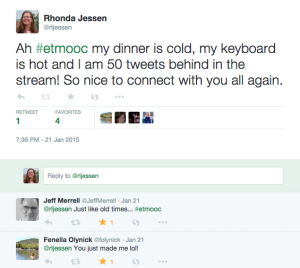 On Tuesday many of the participants from #etmooc, the Educational Technology and Media Mooc, gathered together for a Twitter chat to celebrate the 2nd Anniversary of #etmooc. We were celebrating the second anniversary of the launch of #etmooc, because although the scheduled events for #etmooc ended almost two years ago, the community that developed during #etmooc continues to evolve and grow. It was a great chat, with tweets flying by too fast to keep up with them all. 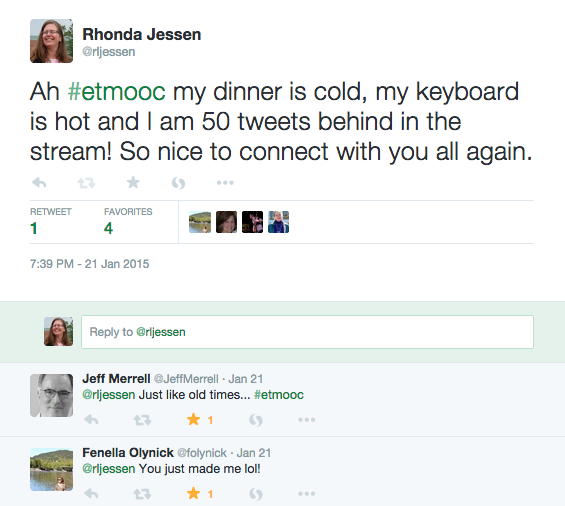 Many #etmooc alumni have stayed connected with monthly, or sometimes more frequent, #PostEtmooc tweet chats and hangouts, but this week was a much larger group than usual. Alec Couros, #etmooc’s lead learner led the chat, although there were many side conversations and catching up. Here is Paul Signorelli‘s Storify of the chat.